I have just spent the past few wonderful days in Batemans Bay with my son Shane, his partner Stacey and my beautiful grandson O'shea. They have only just moved here for Shanes work and they are renting a very nice house with an amazing view over the "Clyde River". Shane has always been a bit of a Gypsy and moved around a lot during his life, but I think now that he has a little family he may stay put a bit more - maybe!! O'shea is now 7 weeks old and a very happy little boy (when he isn't hungry or tired). I have taken quite a few photos while I have been here (mostly of O'shea) and will share them with you over the next few days. We head back home to Eltham tomorrow where I can catch with my girl Rachel and her baby/my beautiful grandaughter Clare. Hi I'm O'shea and how cute am I??? 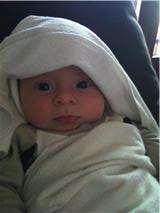 Awww, what a blessing to have such an adorable wee grandson. They grow up way to fast, my son and his wife stopped by with my granddaughter and she seems to grow and know more and more each and every time I see her. What a joy grandbabies are! Enjoy your visit with your granddaughter as well! Have a fantastic week Davine.